Eclipse surge suppressors offer the best price / performance ratio for Home Office / Small Office users looking for a convenient way to combine multiple receptacles and excellent surge suppression capabilities. These models have been designed to meet any needs at home or in the office, from the simple Eclipse Personal to the complete Eclipse ProTel that boasts 8 spaced receptacles, fax / modem protection and a unique flat rotating plug in a compact package. 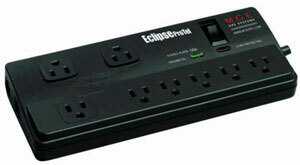 Eclipse is the perfect choice for personal computers, VCRs, DVD players, home theatres or any other sensitive electronic equipment that requires surge protection. Which model's right for you? 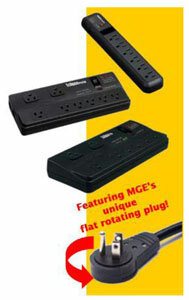 Click for a surge suppressor selector tool.